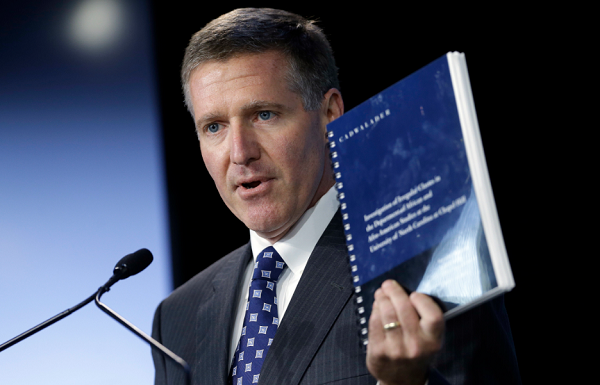 In this Oct. 22, 2014, file photo, Kenneth Wainstein, lead investigator into academic irregularities at UNC Chapel Hill, holds a copy of his findings following a special joint meeting of the UNC Board of Governors. The University of North Carolina at Chapel Hill’s accreditor is looking into recently disclosed statements made by the university to the NCAA. Host Frank Stasio speaks with News & Observer reporter Dan Kane about continuing controversy over academic fraud at the University of North Carolina at Chapel Hill. The school previously told the accreditor that “paper classes,” those that had little to no classwork or instruction, would not count toward graduation. However, recent reporting by the News & Observer shows the school supported the classes in front of an NCAA panel. Host Frank Stasio speaks with News & Observer reporter Dan Kane about the implications of this flip-flopping. They also discuss the impact of the NCAA’s decision regarding the academic scandal at UNC-CH on the collegiate sport system at large. Kane is a panelist at the News & Observer’s next Community Voices event titled: “How to fix what’s broken in big-time college sports.” The forum is at 7 p.m. Wednesday, Nov. 15 at the N.C. Museum of History in Raleigh. It is free and open to the public but registration is encouraged through Community Voices at eventbrite.com.